Camarillo, California, August 18, 2011 – PBS Biotech, Inc., a developer of state of the art single-use bioreactors for the fast growing biotechnology market, announced today it has received the prestigious Business of the Year award from the Pacific Coast Business Times, published in Santa Barbara, CA. The company was one of nine firms recognized by the newspaper for excellence in business and for positive contributions to the local, US and international economy and community at the ninth annual Spirit of Small Business Awards. Dr. Brian Lee, co-founder and CEO of PBS Biotech, received the award for Business of the Year for West Ventura County, from editor and chairman Henry Dubroff during an awards ceremony held today at the Fess Parker’s Double Tree Resort, Santa Barbara. Pacific Coast Business Times is a weekly business newspaper covering the tri-counties of Ventura, Santa Barbara and San Luis Obispo. 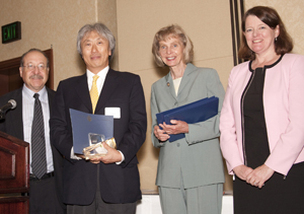 Business of Year Award for West Ventura County was presented to Dr. Brian Lee, second from left, president of PBS Biotech, Inc. by Henry Dubroff, editor and chairman of Pacific Coast Business Times, far left. Congratulating Dr. Lee were US Rep. Lois Capps, CA-23, second from right, and Elizabeth Eckhols, far right, Regional Administrator, US Small Business Administration. “This is a tremendous honor for the PBS Biotech team to be recognized by Pacific Coast Business Times and the business community for our hard work and creativity in developing bioreactors that can accelerate the development of drugs and vaccines worldwide,” said Dr. Lee. “Our focus is to provide our biopharma customers with bioreactors and bioprocess solutions that deliver value and competitive advantage to their business,” he said. PBS Biotech, which has corporate headquarters here, and includes sales, marketing, engineering, manufacturing and clean room operations, won over more than 70 firms nominated in its category. The company expects to make significant additions to its work force across all sectors over the coming months. The firm is growing rapidly as biopharma firms worldwide adopt single-use bioreactors, which offer lower capital and operating costs, increased manufacturing flexibility and shorten development time to market for drug and vaccine products. Business Administration and Bruce Stenslie, EDC-VC president & CEO. Keynote speaker was Linda Weinman, co-founder of lynda.com. PBS Biotech, Inc. is a U.S. corporation headquartered in Camarillo, California that manufactures fully scalable and easy-to-use single-use bioreactors for global biotechnology organizations. The company has developed innovative, efficient, and scalable bioreactors by combining a patented pneumatic mixing mechanism with an advanced, proprietary control system. This novel bioreactor solution offers improved operational efficiency and flexibility with reduced costs and ultimately shorter time to market for biotechnology customers. PBS Biotech is poised for rapid growth by supporting industry demand for single-use technologies.